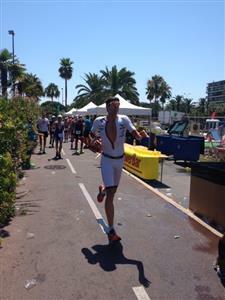 Romain Guillaume seems to slow down a bit - he is at the turnaround of the second lap. 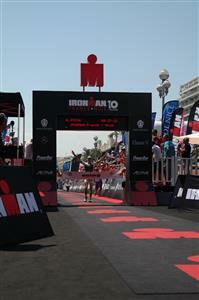 His split for 15.75 kilometers: 1:04:01. Boris Stein is 6:09 behind through 15.75 kilometers. Victor del Corral is flying. He is at 7:22 - made up 6 minutes on 15.75 km. Del Corral's split is 58:10 for the first 15.75 kilometers. Victor del Corral is in second place - he made the pass at KM 29. Exactly 2 minutes - that's the lead for Boris Stein. Romain Guillaume is 2:40 behind the lead. Fantastic run for Caitlin Snow so far. She has passed the hald marathon mark in 1:27:06 - to give you an idea what this means: Romain Guillaume was 5 seconds faster than her on the first half. Lisa Roberts is making ground on Caitlin Snow - she is 3:11 behind at the half marathon mark. Her split: 1:25:26 - just crazy, isn't it? Emma Pooley is 7:28 behind in third place. Last turnaround for Boris Stein - he has passed the 36.75 mark at the Airport. 2:13 - that's the gap to Victor del Corral. Stein stretched his lead a little bit. 5.5 km to go for the 30-year old. 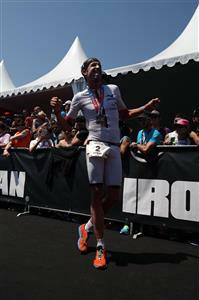 He won IRONMAN Switzerland last year, will he take his second IRONMAN title today in Nice? 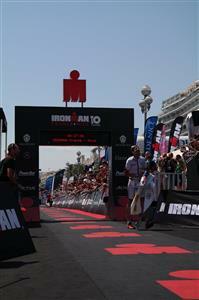 A few more minutes to wait: The finish line in Nice makes ready for Boris Stein. The crowd is loud, ready to party and to cheer at the winner of the anniversary race at the Promenades des Anglais. 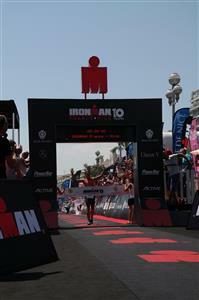 Last refreshments for Boris Stein on the way to his second ever IRONMAN title. Romain Guillaume is still third place - 5:04 down. 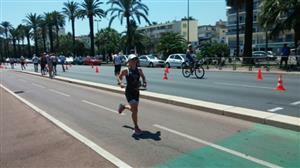 15 km to go for Caitlin Snow - still a 3-minute-lead. Waiting for the 2015 IRONMAN France champion: Boris Stein. Victor del Corral runs into second place! 8:30:00 - that's the time for Victor del Corral.